“To live with Sargent’s water-colours is to live with sunshine captured and held,” according to the painter’s first biographer. Presenting more than 90 of Sargent’s dazzling works, this exhibition, co-organized with the Brooklyn Museum, combines for the first time the two most significant collections of watercolor paintings by John Singer Sargent (1856–1925), images created by a consummate artist with daring compositional strategies and a complex technique. “John Singer Sargent Watercolors” also celebrates a century of Sargent watercolors at the Museum of Fine Arts, Boston. By the time John Singer Sargent reached his mid-40s at the beginning of the 20th century, he had long been saluted as the best society portrait painter of the Gilded Age. But he was having a midlife career crisis. He was a darling of established critics, but to up-and-coming artists, he seemed old-fashioned. Around 1900, he put down his oils and turned to watercolors, capturing landscapes, gardens, exotic locales, and people at leisure, at work and at rest, often on his travels in Europe and the Middle East. Experimenting with unusual compositions and new techniques, he reinvented himself aesthetically. Sargent never did convince modernist artists that he was one of them. But the curators at the two museums that bought many of those works a century ago are hoping for a different outcome when “John Singer Sargent Watercolors” Is on view. This exhibition brings together 93 of Sargent’s best watercolors from 1902-12 for the first time. These were years when he was very experimental, Sargent was living in London, where watercolors were highly prized. His, though, were different from those of British watercolorists — more gestural, for one thing, and mystifying for their use of opaque watercolors at a time when they were typically translucent. The lush results are not only “very beautiful,” but also innovative in ways that are just now being appreciated. Sargent’s approach to watercolor was unconventional. Disregarding contemporary aesthetic standards that called for carefully delineated and composed landscapes filled with transparent washes, his confidently bold, dense strokes, loosely defined forms, and unexpected vantage points startled critics and fellow practitioners alike. One reviewer of an exhibition in London proclaimed him “an eagle in a dove-cote”; another called his work “swagger” watercolors. For Sargent, watercolors were not so much about swagger as about a renewed and liberated approach to painting. His vision became more personal and his works began to interconnect as he considered the way one image—often of friends or favorite places—enhanced another. John Singer Sargent (January 12, 1856 – April 14, 1925) was an American artist, considered the “leading portrait painter of his generation” for his evocations of Edwardian era luxury. During his career, he created roughly 900 oil paintings and more than 2,000 watercolors, as well as countless sketches and charcoal drawings. His parents were American, but he was trained in Paris prior to moving to London. Sargent enjoyed international acclaim as a portrait painter, although not without controversy and some critical reservation; an early submission to the Paris Salon, his “Portrait of Madame X”, was intended to consolidate his position as a society painter, but it resulted in scandal instead. 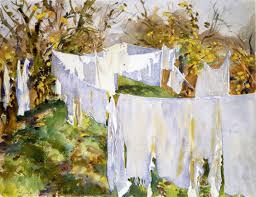 Sargent chose to participate in only two major watercolor exhibitions in the United States during his lifetime, both at the urging of his friend and co-exhibitor Edward Darley Boit. The first, held in New York and Boston in 1909, was a sensation, and its entire contents was purchased by the Brooklyn Museum. The paintings exhibited in the equally acclaimed second show, in 1912, were scooped up by the Museum of Fine Arts, Boston. John Singer Sargent Watercolors reunites nearly one hundred works from these two collections for the first time. Together they trace Sargent’s path across Europe and the Middle East as he explored the subjects and themes that habitually attracted his attention: sunlight on stone, reclining figures, patterns of light and shadow. Sargent’s accomplishments in this medium, in works that delight the eye as well as challenge our understanding of this prodigiously gifted artist. It was totally over whelming in scope, and would be best viewed over several days.